If you’re like me, you don’t do much for SEO on your site. If you’re a better marketer than me and also have tools that you use for SEO, you probably don’t use the built-in SEO tools with the Genesis Theme Framework. The tools do their job and are already there if you want to use them, but they can be limiting, as well as duplicate work being done with any other SEO plugin that you may be using. 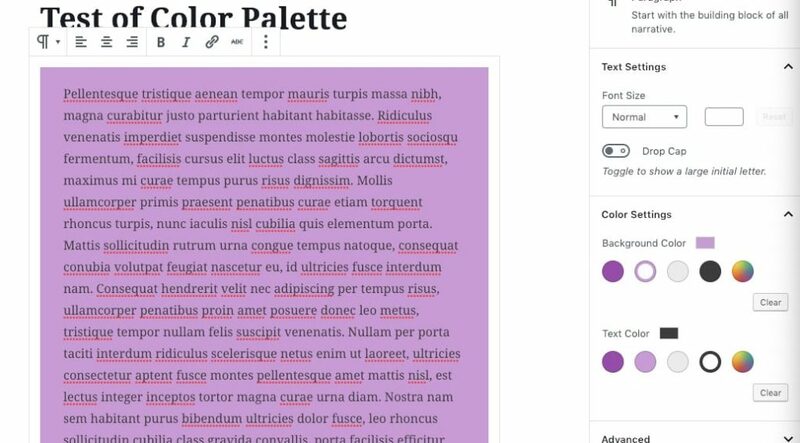 You can choose not to use them, but they still take up some valuable space in your dashboard and while editing pages, and they can be a bit confusing if you’re handing the site off to someone else to manage. Look at all of that space devoted to an unused settings section! One of the many great things about Genesis is that it allows you to easily modify or remove various portions of it without having to directly edit the core files of the theme. 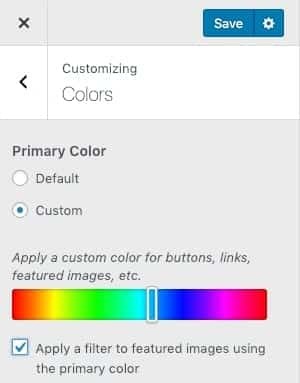 This allows you to modify your child theme only, so that if you ever switch child themes or Genesis updates, your changes won’t break. Place the following code in your functions.php file, or another file that loads on the dashboard. 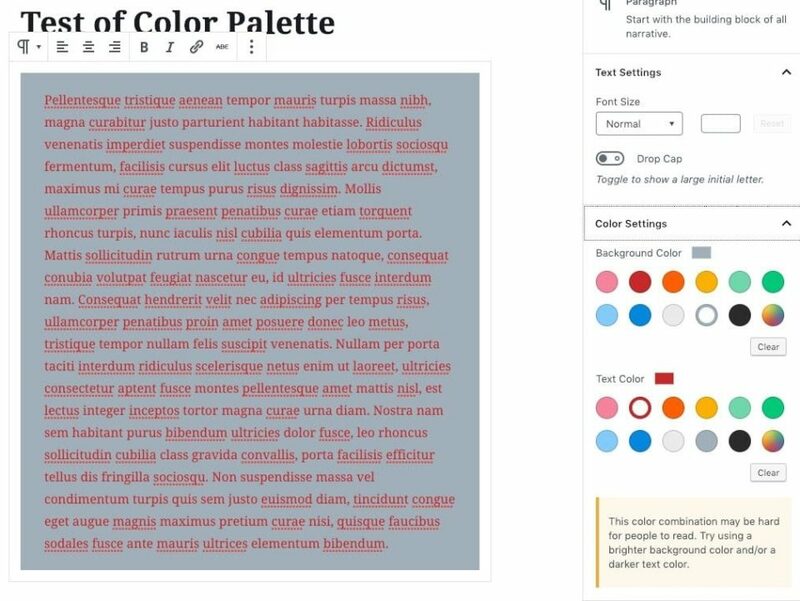 The first line of code removes the SEO metabox in posts/pages/custom post types. 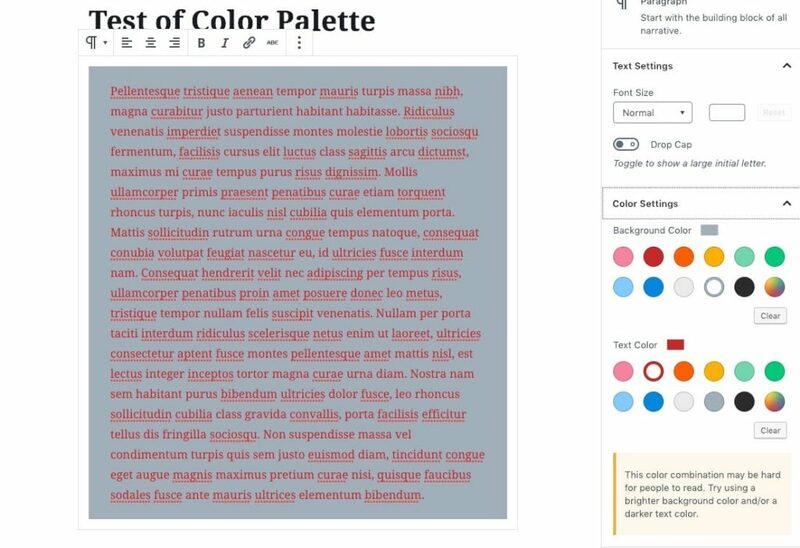 The post editor is already looking cleaner! Now there’s less distraction while writing a post! The second line of code removes the SEO settings menu from the left sidebar in the dashboard. If we’re not using it at all, no reason to have the settings page! Finally, the last line of code removes the SEO settings from taxonomies. That means that you won’t be able to access them on categories, tags, or any other custom taxonomies on the site. And with that, we’re done! Three lines of code (plus a bit of spacing and comments to make it easier to read and remember what we did that for later), and we’ve removed access to the Genesis SEO settings. Again, this isn’t a knock on Genesis, but simply a way to clean up your site a bit if you’ve already invested in another SEO tool for WordPress. I’ll be honest: most of the posts that I write are either because I’ve solved a problem for a client, or because I solved a problem that Past-David created. This is one of those PD problems, where I wrote some code that stopped functioning. When I looked into it, it turns out that I was using the wrong function to test for a variable in PHP. There are a variety of functions made to test the state and value of variables, including ones that can tell you if there is anything available to use at all. Three of these functions that are easy to mix up are isset(), empty(), and is_null(). All three of these functions are built into PHP, so they should always be available for your use when writing code. empty() and isset() are language constructs, while is_null() is a standard function. We’ll go over why that’s important later in the article. Before I discuss the difference and show a few examples, here are the descriptions for empty(), isset(), and is_null() from the php.net manual. Determine whether a variable is considered to be empty. A variable is considered empty if it does not exist or if its value equals FALSE. empty() does not generate a warning if the variable does not exist. Determine if a variable is set and is not NULL. If a variable has been unset with unset(), it will no longer be set. isset() will return FALSE if testing a variable that has been set to NULL. Also note that a null character (“\0”) is not equivalent to the PHP NULL constant. If multiple parameters are supplied then isset() will return TRUE only if all of the parameters are set. Evaluation goes from left to right and stops as soon as an unset variable is encountered. Finds whether the given variable is NULL. What’s the difference between these variable testing functions? You can see from the above definitions that these three functions do similar, but not the same things. You’ve gotta determine if you’re trying to test for whether a variable is null, true or false, and whether the variable has been declared. If you are using empty() you can test if a variable is false, but also if the variable does not exist. This function is best used when you want to ensure both that the variable exists, and has a value that does not equal false. Note that PHP will treat empty strings, integers of 0, floats of 0.0, empty arrays, and the boolean value of false as false. So basically, only use empty() when you want to ensure that there is some actual value to the variable. Since you don’t have to declare variables before using them in PHP, you can get in a position where you are trying to perform actions or run other tests on a variable that hasn’t yet been declared. While it’s best practice to declare your variables before use for this and other reasons, this gotcha is one of the reasons that empty() is used differently from isset(). In the above example, we’ve declared our variable as a string, then tested if the variable is set (it is), and if it is not equal to a different string (it is not). Since both of those tests are true, we would then echo out the sentence in that conditional statement. Finally, is_null() works in a similar manner to isset() as its opposite, with one key difference: the variable must be declared to return true, provided that it is declared without any value, or is declared specifically as NULL. I said above that isset() tests whether a variable has been set or not, which is true, but it can handle no variable being set and providing an output of false. That is helpful if somewhere else in the code the unset() construct has been used to remove a variable from scope entirely. Since isset() is both a language construction, and can handle variables that aren’t declared, I’d generally recommend it over using is_null() in any situation. If you need to use is_null(), I might suggest finding a way to rewrite your code instead. I mentioned before that isset() and empty() are both language constructs in PHP, where is_null() is a built in function. Language constructs are reserved keywords that can evaluate whatever follows them in a specific manner. That means that it already knows what to do without having to find the definition of the construct like it would a function. The main things to keep in mind between the two when evaluating your code is that language constructs in PHP are slightly faster (but honestly not enough to worry about for speed optimization), they can’t be used in variable functions, and they don’t throw any errors when evaluating variables that don’t exist. Many times I see warnings and notices because a variable hasn’t been declared, and no one has confirmed that the variable already exists before trying to do some other conditional check with it. Using isset() and empty() can go a long way to avoiding those errors. The following table has been taken directly from a demo created by Virendra Chandak on his personal site. You can view the demo here. I’ve mentioned before on the blog that I use Alfred App for OSX and love it. The app helps me do a lot more things quicker, without having to leave the keyboard. Lots of quick things can be done via Alfred! I also use Homebrew, which is a package manager for OSX. Basically, it’s a way to install and update applications for your mac via the command line. Since I’ve already written some posts about it in the past (as well as how to create the workflow that I’m discussing today), I’m going to refer you back to those posts instead of reiterating them. Why write this post again? 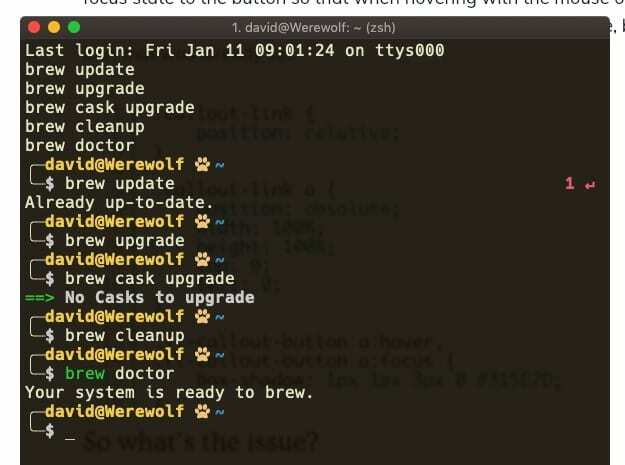 I have always gone to the terminal, used brew search (and the now deprecated brew cask search to look for applications that I wanted to install. But this meant opening terminal if it wasn’t already, typing the name that I hoped was there, and seeing what came up while guessing if it was the right app when installing. 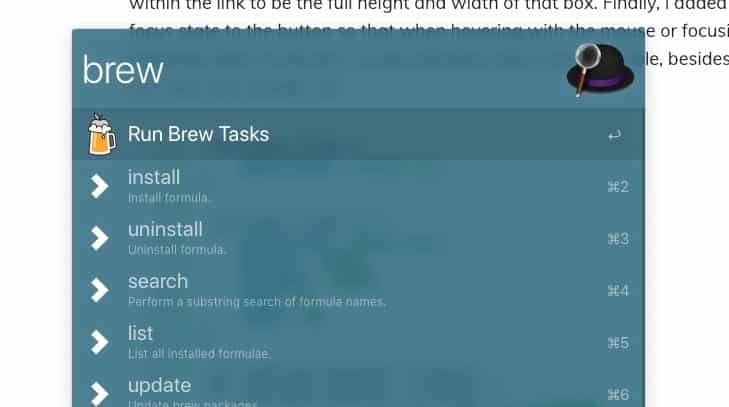 I recently discovered an Alfred workflow meant specifically for Homebrew tasks, which allows you to do all of the normal Homebrew commands, including searching packages. You can find Homebrew and Cask for Alfred on Github, and it’s already wrapped up as a workflow to install. I can still use my existing homebrew workflow to update all existing packages that I’ve installed, as well as cleanup when done. Thanks to some updates since the last post about this, there are even fewer tasks to run. But now I also have access to the normal homebrew tasks, including install, uninstall, search, update, and all of the flags and various commands for them. Even better, when you search for a formula it includes a link to the Github page for it, meaning I can see what that package actually does and not have to guess. Again, this is without ever having to leave the keyboard. Having tools like this allows me to work faster and waste less time on managing applications, as well as keeping them all up to date easier. I already procrastinate enough, and I don’t need searching for apps or waiting for them to update when I open them to help me waste even more time! I use Alfred App and Homebrew for OSX to make finding, installing, and updating all of my applications easy!